Rafat Alsoos is standing behind the counter of his butcher shop in the West Bank town of Beit Jala, just a few hours after his wife gave birth to their first child. Their baby son is so new, they have yet to settle on a name for him and Alsoos has only had a few hours to hold the 7.4 pound (3.4 kilogram) newborn with black wavy hair. 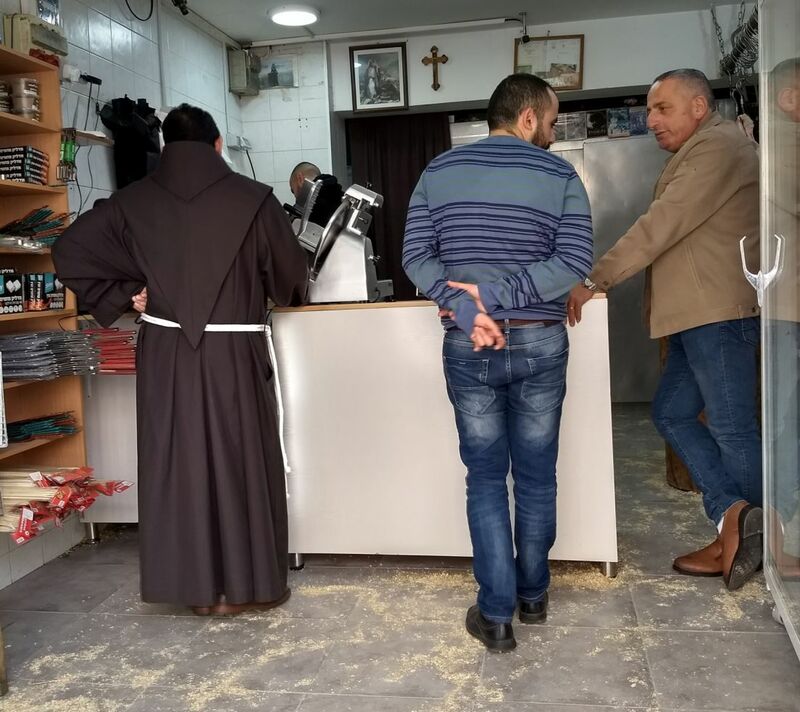 “I came in because there was no one here to run the shop and it’s Christmas time – this season is our busiest,” says Alsoos, 27, a Palestinian Christian follower of the Greek Orthodox Church. 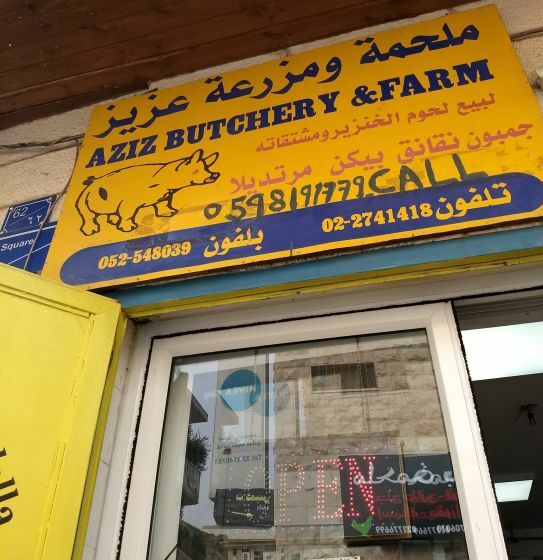 The Aziz Butchery and Farm shop in this small town south of Jerusalem was opened by his grandfather in 1920, meaning their pig farm – the only one in the West Bank – has been in the family for almost 100 years. Alsoos and an older sister are the only members of his immediate family still living in Beit Jala. For most of its centuries-long history, this was a majority Christian village. Now, though, it has a growing Muslim population and a shrinking Christian one. Their parents and five other siblings live in Canada, in a suburb of Toronto. Which makes Rafat Alsoos, who moved back here from Canada in 2013 after attending high school and college, one of the dwindling number of Christians in the Holy Land and the Middle East as a whole. “This is my homeland, I grew up here,” he says with a broad smile. “It’s a good thing to be in your homeland, no? It’s a different feeling. It’s like something inside you – you can’t leave it, especially this country and this city. Jesus was born here,” he adds, referring to Bethlehem just down the road. “It’s the Holy Land,” he says, emphasizing the word “holy.” An olive wood cross hangs on the white tile walls behind him, next to a row of postcard-sized images of various saints, including St. George and St. Nicholas. Just down a steep road from his butcher shop is the gold-spired Greek Orthodox Church of St. Nicholas, built on the spot where tradition says the fourth-century bishop once lived in a cave. When Alsoos was a boy, he remembers it was full here on Sundays and other services. Now, though, he feels the pews thinning out. “It is difficult to live without your family,” he says, though quickly adds that having an extended family still in town does help. “But of course my wife gave birth today, and if my mom were here it would be easier,” Alsoos says. Even though he hopes to remain in Beit Jala, he has already started the process for his wife, also a Palestinian Christian, to get Canadian citizenship. “We also have work here, land and a house. We can’t just leave. Even my dad – he doesn’t live here but he cannot leave either,” adds Alsoos, explaining that his father tries to return when he can, including a few days from now when he will join his son to help out at the shop. Alsoos has an easy smile. His dark hair is cropped short and topped with a pair of sunglasses, and he wears a dark hoodie and jeans. He is friendly with his customers, most of whom he knows well and by name, and by what cut or kind of pork they like. One of his customers comes in and Alsoos slices ham for him. He explains that the man is trying to cut down on his bacon habit because of heart problems. They all come into the shop with greetings of “mabrouk” (Arabic for congratulations) for the birth of his son. “It’s a small town,” Alsoos smiles. With a population of about 12,000, Beit Jala and the neighboring towns of Bethlehem and Beit Sahour constitute the main Christian population bloc in the West Bank – locals call it “the Triangle” – roughly 25,000 people. Another 25,000 live in other parts of the West Bank and the Gaza Strip (according to data based on figures from the most recent Palestinian census in 2007 – new data is due to be published next year). The Triangle was historically a Christian majority, but in 2007 was about 40 percent Christian and 60 percent Muslim. In Beit Jala, some 70 percent of the population was Christian in 2007, but city officials estimate the number has now dropped to 60 or 65 percent. Bethlehem has seen the most significant Christian flight in recent years, with its mayor reporting in 2016 that the Christian population there has slumped to as low as 12 percent. Christian numbers have been decreasing for decades in Israel and the West Bank, where Muslims tend to have more children than Christians. Most Christian families have relatives abroad, making the emigration process easier for them. Beit Jala Christians and other Palestinian Christians have often moved in large numbers to Chile, for example, which is believed to be home to the largest diaspora Palestinian community outside of the Middle East. According to “Palestinian Christians: Emigration, Displacement and Diaspora,” a new study by Mitri Raheb – a Lutheran pastor and president of Dar al-Kalima University College of Arts and Culture in Bethlehem – Christians comprised about 11 percent of the overall population of Ottoman Palestine (including present-day Israel, Gaza and the West Bank) in 1900. That number has since dwindled to 1.7 percent, he writes. The most significant drop, according to the study, came in 1948-49 during the Israeli War of Independence (what Palestinians refer to as the Nakba – Arabic for catastrophe). That’s when the Christian population in the Holy Land dropped from 8 to 2.3 percent, Raheb notes. Raheb writes that Christian flight was accelerated by the violence of the second intifada, which broke out in the fall of 2000 and lasted till early 2005. 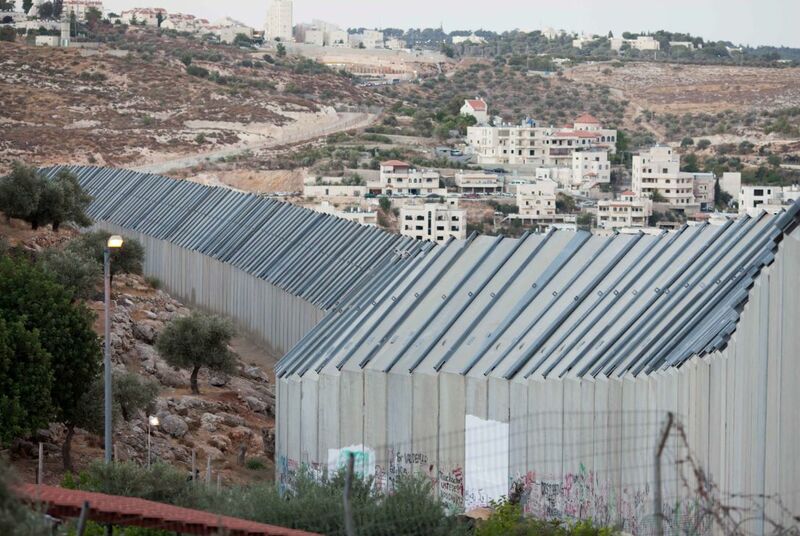 In Beit Jala, whose borders include land that is under Israeli control, city officials say Christian emigration has increased in recent years because some families lost their agricultural land after it was expropriated by Israel to build the West Bank separation barrier. It was in 2000 that Aziz Alsoos, Rafat’s father, began the expensive process of visa requests and legal fees to relocate his family to Canada. “Everyone who gets the chance to leave, leaves,” admits Alsoos between customers, who come from all over the West Bank to one of the few butcher shops selling pork in the territories. Business dropped off sharply after 2000, he says, when Palestinian Christian customers from East Jerusalem, Russian-speaking immigrants to Israel and even European diplomats stopped coming because of the security situation. “Trust me. First of all there’s the political situation, which is always worrying. There are always problems,” says Alsoos, for once not smiling. Alsoos points out that just a 10-minute drive from where he is slicing a ham and packaging pork chops, and where the loudest noise comes from beeping car horns on the streets outside, there have been ongoing violent clashes at Rachel’s Tomb in Bethlehem, in response to U.S. President Donald Trump’s decision earlier this month to recognize Jerusalem as the Israeli capital. The Palestinians, meanwhile, claim East Jerusalem as their future capital. Alsoos says high unemployment in the West Bank coupled with the security situation is the reason people he knows and loves have left. Of his closest group of friends growing up in Beit Jala, who all attended a school run by the Lutheran Church, all 10 have left – scattered between the United States, Canada and Sweden. “Of course I miss my friends, I grew up with them – but everyone has their life now,” he says. These days, they stay in touch mostly through social media. Alsoos has managed to make new friends in Beit Jala, most of them fellow Christians, but also some Muslims. He says it’s easier to be friends with younger Muslims closer to his age, who tend to be more “open-minded” about religion. He even has some Muslim customers. It’s forbidden for them to have pork according to Islamic law, so usually they have a Christian friend buy it for them. But having the only pig farm in the West Bank and the only pork butchery in a town whose Muslim population is growing has made for some tense moments. As the day progresses, more customers crowd the shop. There’s a businessman from Ramallah; a Franciscan monk from Bethlehem. There is also his aunt (on his father’s side), Abeer Khamis, 53. She notes that not only are her brother and most of his family in Canada and another sister in Michigan, there are also relatives in Chile and Peru.